Join Hatikvah Chapter to learn about the true story of Canadian Intelligence Service's greatest cover-up! About the author: Elisa Hategan is an author, journalist and subject matter expert on neo-Nazi and extremist political movements. Recruited as a teenager by the white supremacist Heritage Front, she was groomed to be a leader of the neo-Nazi movement by Holocaust denier Ernst Zundel. At age 18, her court testimony against Heritage Front leaders contributed to the collapse of the group. After discovering her family’s Jewish roots, she converted to Judaism. This is the ticket purchase page. 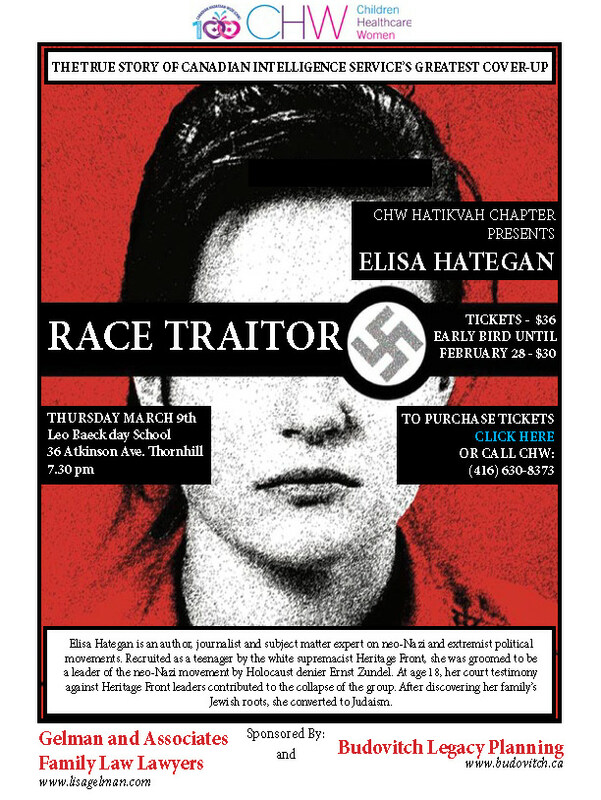 If you will not be attending the event, but would like to support Hatikvah Chapter Presents: Elisa Hategan, please CLICK HERE.